STUDY DESIGN: A retrospective review of patients undergoing single-surgeon occipito-cervical fusion. 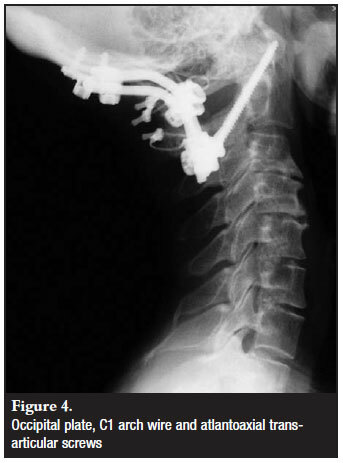 OBJECTIVE: The aim of this study is to evaluate the surgical indications, techniques and clinical outcomes of occipito-cervical fusion, including C2 fixation methods and complications. MATERIALS AND METHOD: Thirty-four consecutive patients (16 males, 18 females) who underwent occipito-cervical fusion were reviewed. The indications for fusion were instability due to inflammatory diseases (13), trauma (9), congenital abnormalities (9), infections (2) and tumours (1). Nine patients (all but 1 paediatric) underwent fusion with bone grafting and halo immobilisation. Twenty-five patients underwent posterior instrumented fusion. Halo removal was performed after 6 weeks and soft collars were worn for 6 weeks in the instrumented group. 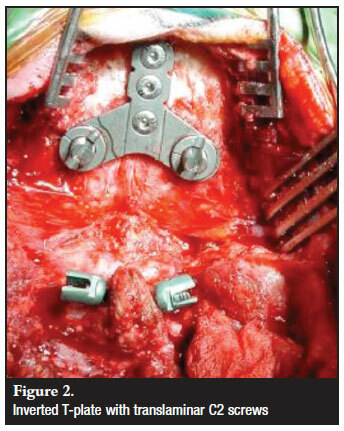 Surgical techniques and clinical outcomes (stability, fusion, complications) were reviewed. RESULTS: Clinical and radiological fusion was attained in all patients available for follow-up, with an average of 2.7 months in the uninstrumented group and 5.2 months in the instrumented group. All fusions resulted in resolution of preoperative pain and an improvement in pre-operative neurology. Two patients demised in the acute postoperative period as a result of the underlying pathology. Eighteen patients required simultaneous decompressions. No instrumentation failures occurred. Superficial wound sepsis occurred in 4 patients, one subsequently requiring instrumentation removal. CONCLUSION: Occipito-cervical fusion is a safe and reliable procedure, predictably providing stability and improvement in preoperative pain and neurology. Multiple cervical fixation options are available according to surgeon preference and anatomical variants. Occipito-cervical fusion (OCF) is required when the junction is rendered unstable by a variety of pathological conditions including congenital abnormalities, inflammatory diseases, trauma, tumours and infections. Over the years there has been an evolution of surgical technique as implants have developed to accommodate the challenges of the occipito-cervical junction. These range from onlay bone graft techniques with halo jacket immobilisation to sophisticated instrumentation techniques. Early on, tenuous wire fixation methods were utilised. Prof Brookes Heywood published on the use of the T-plate (usually used in distal radius fractures) as a fixation option.1 His concept was not dissimilar to the modular occipital plates used today. We undertook a retrospective review of our patients undergoing OCF assessing surgical indications, technique, clinical outcomes and complications. Thirty-four consecutive patients with occipito-cervical disorders undergoing OCF between December 2002 and February 2010 were identified. All procedures were performed by the senior author (RD) at Red Cross Children's Hospital, Groote Schuur Hospital and Constantiaberg Medi-Clinic. The study was approved by the Research Ethics Committee of the Health Sciences Faculty, University of Cape Town, reference 188/2010. There were two groups in this cohort, viz. a paediatric (< 16 years) and adult group. There were 12 patients in the paediatric group which included 5 females and 7 males. The average age was 8.6 years (1-16 ± 5.0 years). The adult group included 22 patients, 15 females and 7 males, with an average age of 52.9 years (25-79 ± 15.4). The presenting complaints at the time of surgery were non-traumatic pain or instability, myelopathy and traumatic instability as shown in Table I. The paediatric myelopathy was due to Down's syndrome, Morquio's syndrome, congenital kyphosis and Conradi-Hunerman syndrome. In the adult group, the myelopathy was largely due to rheumatoid arthritis (5) and 1 tuberculosis. The myelopathies were generally mild and the patients were ambulant pre-operatively. Other paediatric indications included traumatic atlanto-occipital dissociation and chronic granulomatous osteitis. Rheumatoid arthritis (13) predominated as a cause in the adult group, followed by trauma (7), tumour (1) and tuberculosis (1). 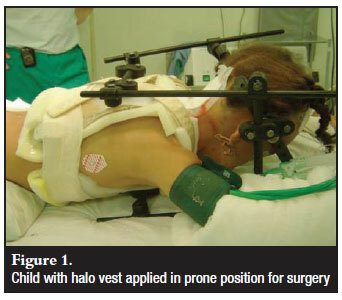 Nine patients (8 paediatric, 1 adult) underwent uninstrumented fusions with halo immobilisation (Figure 1). Twenty-five patients (21 adult, 4 paediatric) underwent instrumented fusions. The PCR / Summit system (DePuy®) was used in 11 patients the Axon (Synthes®) in 14 patients. Eighteen patients required simultaneous spine decompression due to myelopathy or stenosis. The majority were a posterior C1 arch resection (14), sub-axial laminectomy (3) and 1 necessitating a trans-oral odontoidectomy. Pre-operative X-rays including dynamic views, CT and MRIs were reviewed to determine stability, the extent of soft-tissue abnormalities (tumour and pannus), bony pathology and their influence on planned fixation types and level. Patients underwent general anaesthetic induction while supine. The halo group then had the halo applied and halovest assembled. Any misalignment was reduced if possible and confirmed on lateral image. The patients were re-positioned prone on the anterior halo struts and ring. The surgical procedure was performed through the posterior halostruts, and bone graft was harvested from the posterior iliac crest after ensuring the vest allowed adequate access. In the instrumented group, a Mayfield clamp was applied before re-positioning on a Relton-Hall frame. Fluoroscopy was used to confirm the desired neutral cervical position, the reduction of anatomical malalignment, and the placement of instrumentation. Posterior iliac crest bone graft was utilised in 27 patients. Allograft was used in seven paediatric and trauma patients. The occipito-cervical area was exposed via a posterior midline approach with sub-periosteal exposure of the skull from the external occipital protuberance (EOP) to the required cervical level. 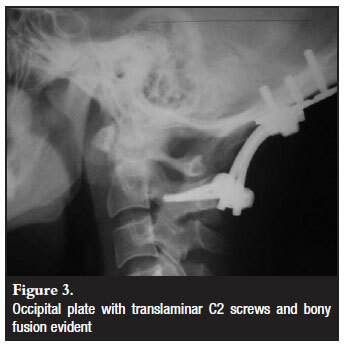 Occipital fixation was achieved with a T-plate fixed in the midline with 4.5 mm bicortical screws (Figure 2). The EOP was burred on the caudal side to facilitate plate placement, both flat against the skull and as cephalad as possible to allow fixation in the thickest bone. Careful drilling and tapping with the use of depth restriction guides was done. After an initial observation of subcutaneous plate-rod articulation prominence, subsequent plates were inverted. Skull plates were used in all patients except in a one-year-old patient where two paramedian plate/rods were applied due to anatomical constraints. Bicortical fixation was used. Different cervical fixation methods were employed as determined by the indication for fixation and anatomical variants (Figures 3-5). These included C1/2 transarticular (3), C2 pedicle (14) or translaminar screws (7) and sub-axial lateral mass screws. The default C2 screw was the pedicle screw with the translaminar screw as a bail-out if the pedicle was not possible due to anatomical or technical limitations. All but one construct bypassed C1. In this patient C1 lateral mass screws were utilised. Seven patients were fixed to below C2 level. The fixation option was decided upon intraoperatively according to screw hold and surgeon satisfaction. The average surgical time in the uninstrumented group was 83 minutes (40-195) and 137 minutes (85-275) in the instrumented group. The average blood loss was 142 ml (50-300) in the uninstrumented group and 513 ml (100-3 300). The 3 300 ml blood loss was due to the vertebral artery injury. Halo jackets were worn for a minimum of 6 weeks, and removed as soon as possible thereafter as the children required a general anaesthetic for removal. In the instrumented group, a soft cervical collar was worn for 6 weeks postoperatively. Follow-up visits were arranged for 6 weeks, 3 months, 6 months, 1 year and annually thereafter, with radiographic follow-up at each visit. Fusion was assessed on lateral radiographs as cross-trabeculation of bone mass, absence of peri-screw lucency and absence of instrumentation failure. Twenty-eight patients were available to follow-up with an average follow-up of 9.9 months (648). Four patients failed to return and two demised peri-operatively. Successful clinical and radiological fusion was obtained in all 28 patients available for follow-up. In the uninstrumented group, all 8 patients fused at an average time of 2.7 months (1.54 months). In the instrumented group, 20 patients fused at an average time of 5.2 months (312 months). All patients with pre-operative radicular pain had resolution of their symptoms. Those with myelopathy had improvement to normal or near normal except for 2 infants in the paediatric group who remained myelopathic at follow-up. The two patients who demised in the acute period postoperatively included an adult who had suffered traumatic atlanto-occipital dissociation and quadriparesis. She succumbed to respiratory complications in ICU. The second patient was a child with Trisomy 21. She required the transoral decompression and suffered a gastric stress ulcer with perforation in ICU post-surgery. There were no instrumentation failures or revisions required. Two patients had minimal occipital plate lift-off (12 mm) on the postoperative films. This did not progress and both went on to successful fusion. One patient had an intra-operative cerebrospinal fluid leak from the occipital drill which stopped on screw insertion. There were no subsequent problems. Four patients suffered from superficial postoperative wound infections. Two required oral antibiotics and dressings. The other two required washouts in the early postoperative period and settled on oral antibiotics. One subsequently required instrumentation removal at 2 years postop due to recurrence of infection. Once removed, the infection settled and she continued to have pre-operative symptom resolution. Of these two patients requiring wound washouts, one was a rheumatoid arthritis patient using methotrexate at the time of surgery and the other the Down's child. One patient, with the atlanto-occipital dissociation had an intra-operative unilateral vertebral artery violation during C1 screw placement. This settled with local measures. One patient suffered from a postoperative deep vein thrombosis. Concerns over fusion rates and complications with earlier techniques47-53 led Heywood to try plate and screw fixation, with additional wire fixation reserved for long segment fusions only.1 Limited by the technology of the time, he used a distal radius T-shaped plate from the standard 'small fragment trauma set' with routine bone grafting and halo immobilisation. In addition, he studied cadavers and identified that the occiput was thickest in the midline. Twelve out of 14 patients went on to satisfactory fusion, with one failure in a rheumatoid arthritis patient. Onlay bone grafting and halo immobilisation has been shown to be an effective procedure for OCF in children and adolescents with upper cervical instability.64-66 This is due to rapid fusion rates, but many adults find prolonged halo restriction unacceptable. More recently C1 lateral mass-C2 pedicle screw combinations have been found to be superior to the C1-2 transarticular method.80-81 Translaminar screws have been reported to be a safe alternative.82 They reduce risk to the vertebral arteries and are recommended for patients with high riding vertebral arteries or small pedicles. OCF, whether rigid instrumented fusion or onlay bone grating and halo immobilisation, remains a successful, safe and reliable procedure for the stabilisation of the OC junction for a variety of indications. It achieves stability and a marked improvement in pre-operative pain and neurology. The on-lay fusion with halo immobilisation remains a good option in the paediatric group who experience rapid fusion and tolerate the halo well. In adults the advantage of rigid fixation obviating prolonged immobilisation makes it a valuable option. Modular instrumentation allows individualisation of fixation techniques to minimise risk and maximise stability, based on patient-specific anatomy. 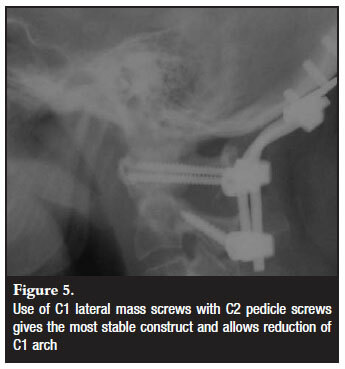 C2 screws provide excellent cervical purchase, but the surgeon should be capable of multiple techniques as this option is not possible in all individuals. No benefits were received by any of the authors from a commercial party related directly or indirectly to the subject of this article.